On March 11, 2019, Tonix Pharmaceuticals Holding Corp. (NASDAQ:TNXP) announced the first patient has been enrolled in the RECOVERY Phase 3 study of TNX-102 SL in patients with posttraumatic stress disorder (PTSD). The RECOVERY trial is a randomized, double blind, placebo controlled study of TNX-102 SL over 12 weeks with the primary endpoint being the Week 4 change in CAPS-5 score from baseline between TNX-102 SL and placebo-treated patients. The Week 12 change in CAPS-5 score will be a key secondary endpoint. 1) Inclusion will be limited to individuals with PTSD who experienced their trauma within the past nine years, while the HONOR trial included individuals who experienced a trauma from 2001 or later. A retrospective analysis showed a treatment effect in patients treated within nine years of trauma, while treated patients who were > nine years from their trauma failed to separate from placebo. 2) The study will include both civilian and military PTSD patients, while the HONOR trial had limited inclusion to only those with military-related PTSD. 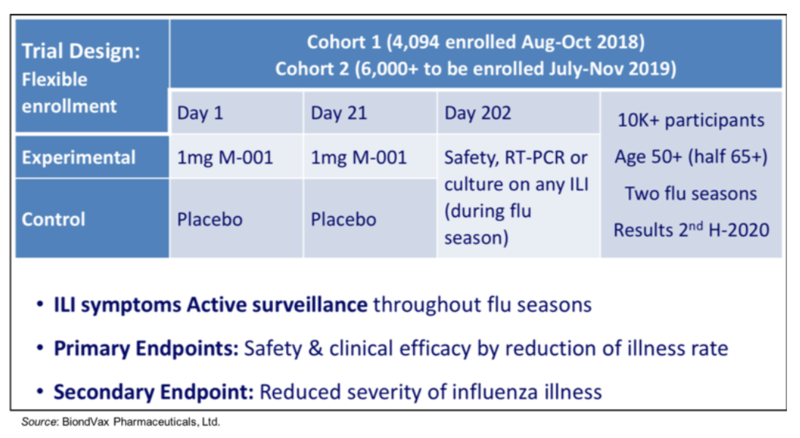 3) The total number of study subjects is anticipated to be approximately 250, compared to approximately 550 subjects that were to be enrolled in the HONOR trial. We believe enrollment will proceed smoothly with the inclusion of civilian PTSD subjects and we anticipate topline results in the first half of 2020. On April 4, 2019, Tonix announced the expansion of the 5.6 mg TNX-102 SL program to include the treatment of fibromyalgia. The company received the FDA meeting minutes following a recent clinical guidance meeting which indicated the agency supports the advancement of TNX-102 SL as a centrally acting non-opioid analgesic for the management of fibromyalgia. Two positive Phase 3 trials will support the registration of 5.6 mg TNX-102 SL in fibromyalgia along with long-term safety exposure data from the PTSD program. Tonix previously tested 2.8 mg TNX-102 SL in fibromyalgia in the Phase 3 AFFIRM trial, a 12-week, randomized, double blind, placebo controlled trial of 519 patients who were administered either 2.8 mg TNX-102 SL or placebo at bedtime in a 1:1 randomization. The trial did not achieve statistical significance in the primary efficacy endpoint of the proportion of patients who reported a 30% or greater decrease in pain from baseline (P=0.095). The pre-specified statistical method utilized for the primary efficacy analysis counted all patients who withdrew from the study as non-responders, even if the reason for leaving the study had nothing to do with efficacy or tolerability. Another standard statistical method that takes into account the reasons for discontinuation showed statistical significance in the 30% responder analysis (P=0.012). Additionally, the same pain data analyzed by mean pain, an FDA accepted pain endpoint, demonstrated significant separation from placebo by mixed model repeated measures (MMRM) analysis (P<0.001). While the AFFIRM trial did not meet the primary efficacy endpoint, 2.8 mg TNX-102 SL did show statistically significant effects on two other key secondary endpoints, Patient Global Impression of Change (PGIC) and Fibromyalgia Impact Questionnaire-Revised (FIQ-R) function and symptom domain scores, which assess global improvement, a range of fibromyalgia symptoms, and functional improvement. New approaches to treat fibromyalgia are needed, as approximately one-third of patients are on chronic opiates. Given that 2.8 mg TNX-102 SL showed clinical benefit in a number of different outcomes, we believe that increasing the dose to 5.6 mg is likely to provide evidence to support its approval in the management of fibromyalgia. The company will need to secure additional funding to advance the fibromyalgia program as well as finalize and submit a new Phase 3 protocol and statistical analysis plan for FDA acceptance. On March 7, 2019, Tonix announced that the European Patent Office issued European Patent No. 3246031 to the patent “Method for Treating Neurodegenerative Dysfunction”, which claims the use of TNX-601 for treating neurocognitive dysfunction associated with corticosteroid treatment. The patent has an expiration date in April 2029. TNX-601 is a novel formulation of tianeptine, a tricyclic antidepressant (TCA) molecule that has different pharmacological properties than other TCA’s such as amitriptyline and imipramine. It is thought to exert its antidepressant effects though indirect action on glutamate receptors (both AMPA and NMDA) that causes release of brain-derived neurotrophic factor (BDNF) (McEwen et al., 2010). Tianeptine is currently available as a treatment for depression in the E.U., Asia, and Latin America, but is not approved in the U.S. or U.K. Tonix has discovered a novel salt and polymorph of tianeptine that could lead to improved stability, consistency, and manufacturing. In addition to its potential use in neurodegenerative dysfunction, the company also plans on developing TNX-601 as a daytime treatment for PTSD, and due to its reported pro-cognitive and anxiolytic effects it may treat PTSD by a different mechanism of action compared to TNX-102 SL. Tonix is currently conducting an ex-US, non-IND human pharmacokinetic study of a novel tianeptine formulation and we anticipate data from this study in the second half of 2019. On March 18, 2019, Tonix announced financial results for the fourth quarter and full year 2018. As expected, the company did not report any revenues for the fourth quarter of 2018 or the full year 2018. Net loss for the fourth quarter of 2018 was $10.9 million, or $6.10 per share, compared to a net loss of $5.5 million, or $7.07 per share, for the fourth quarter of 2017. The net loss in the fourth quarter of 2018 included a one-time, non-cash preferred stock deemed dividend. For the fourth quarter of 2018, R&D expenses totaled $5.1 million, compared to $3.6 million for the fourth quarter of 2017. The increase was primarily due to costs related to closing out the Phase 3 HONOR study and other activities related to the PTSD program. G&A expenses totaled $2.6 million in the fourth quarter of 2018, compared to $1.9 million for the corresponding time period of 2017. The increase was primarily due to an increase in patent and investor relations costs. Net loss for the year ending Dec. 31, 2018 was $29.4 million, or $26.81 per share, compared to a net loss of $21.1 million, or $31.69 per share, for the year ending Dec. 31, 2017. R&D expenses for the full year 2018 and 2017 were $17.6 million and $13.3 million, respectively. The increase was predominantly due to continued development work related to the PTSD program, including completion of the pivotal Phase 1 bridging study. G&A expenses for the full year 2018 and 2017 were $8.8 and $8.0 million, respectively. The increase was primarily due to increased patent and investor relations costs. The company reported $25.0 million in cash and cash equivalents as of Dec. 31, 2018, which we believe will be sufficient to fund operations through the end of 2019. As of Mar. 13, 2019, the company had approximately 6.1 million shares outstanding and when factoring in warrants with strike prices of $3.50 the company has a fully diluted share count of approximately 11.0 million. All Preferred Shares that were sold in the offering in Dec. 2018 have been converted to common shares. In addition, we believe based on conversion of preferred share that the funds that led that financing have significantly reduced their positions, which should alleviate some selling pressure the stock has recently been under. We’re glad to see that the RECOVERY trial is underway, and we believe that the changes incorporated into that trial increase the probability for success. We look forward to evaluating the topline data in the first half of 2020. The fibromyalgia program for 5.6 mg TNX-102 SL is a nice complement to the PTSD program and could lead to a welcome treatment options for those patients. Lastly, the company is also advancing TNX-601 through the ongoing pharmacokinetic study. Our valuation remains at $10 per share.